The Vice Principal, Ming, is being mind-controlled by the alien school supplies; Who are working with some students to get Albert expelled! But who on Earth would want to have Albert not be in school anymore? This is the end of this chapter of Albert the Alien, but worry not – another chapter goes live starting Friday! In the next adventure, Albert the Alien and friends take a field trip (Albert’s first on Earth) to a history museum and encounter the Mummy King! But who is working with the alien school supplies? And what has happened to the principal (they said he’s been missing for a week on this page)? We’ll find out all this and more as we reach the last few chapters of this story arc (and what will be our next printed collection), ALBERT THE ALIEN VOL 2: THE SUBSTITUTE TEACHER FROM PLANET X! 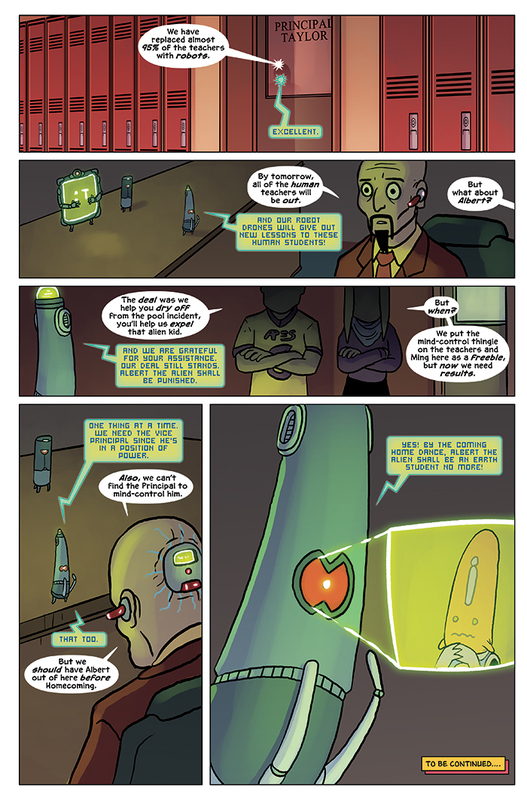 It’s November, and the ALBERT THE ALIEN vol 1: NEW IN SCHOOL graphic novel is out! We are putting together our orders from the Kickstarter (as well as any pre-orders we received) this month. If you didn’t order a copy but want one, you can still get it! Click the link to get one today.